Description - The Titan's portable inverter is ideal for powering DVD players, mobile phones, laptops and many more electronic appliances. The multi-protection features such as over-temperature, over voltage and overload protection all help strengthen security when utilizing the inverter. 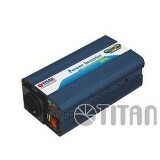 Undoubtedly, Titan's inverter is the best power mate for you!